Its official – winter is over! The sun is shining, snowbanks are melting, and Lake George is warming up. 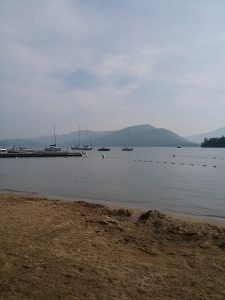 With spring break right around the corner, visitors to Bolton Landing on Lake George will be searching for something fun to do. With all of the outdoor recreation, shopping, and dining available in Bolton, they have plenty to be excited about. Get outside and enjoy the Adirondacks! The snow is finally gone, which means the hiking trails and parks in Bolton Landing on Lake George are ready to be explored. Even beginners will love hiking trails like the Pinnacle, Cat Mountain, Thomas Mountain, or Fifth Peak. These easy-to-moderate trails are located just outside of Bolton Landing and offer a great introduction to Adirondack hiking. Those who would rather not commit hours to a hike can opt for a walk in one of Bolton Landing’s beautiful public parks. Rogers Memorial Park features a full beach, a lawn, and a recently renovated pier that’s perfect for sightseeing. Just down the street, Veterans Memorial Park has a sprawling beach and lawn as well as a full playground and basketball court. One of the best parts about the spring in Bolton Landing is that many of the shops with limited hours during the winter are open and ready for visitors. 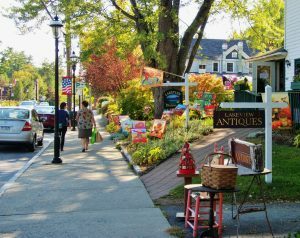 You can find nearly anything in Bolton Landing shops, ranging from Adirondack antiques to Lake George-themed t-shirts. If you’re searching for a Mother’s Day or birthday gift, stop by Trees Adirondack Gifts & Books or Happy Jacks. Those searching for new spring clothing will love Serendipity Boutique and local. If the kids want to spend some of that spring cleaning allowance, Happy Jacks Kids and the Indian Tepee are the places to shop. Eating outside is a great way to enjoy that sunshine that’s been so difficult to find all winter long. 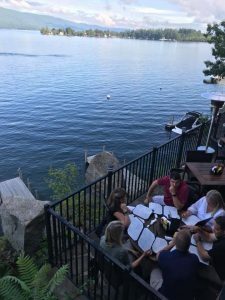 Several restaurants in Bolton Landing on Lake George set tables on the sidewalk or their outdoor decks and serve food and drinks in the sun. For finger food, a burger, or a sandwich, grab a table at Frederick’s on their deck. For stunning views and delicious food, try the Algonquin or Blue Water Manor. For an excellent dinner on a warm spring evening, stop at Cate’s Italian Garden, Beyond the Sea, or the Huddle. If you’re just interested in a crisp beer, stop at the Bolton Landing Brewing Company. 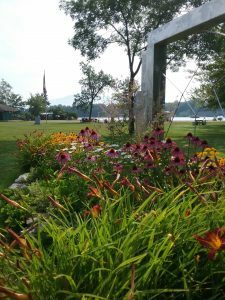 Hiking, shopping, and dining aren’t the only spring activities in Bolton Landing! Golfers will be amazed by the beauty and challenge of the Sagamore Golf Course. 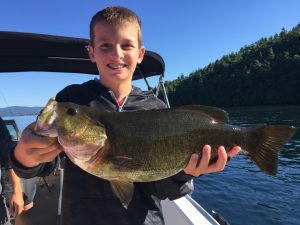 Once the ice is gone, explore the lake with a boat rental or try to land a keeper on a fishing charter. There’s so much to do now that the weather is warming up – plan your trip today! Are you going to Bolton Landing this spring?